Deflects wind and reduces noise of sun roof or moon roof. Reduces wind noise and turbulence. Maintain your vehicle's aerodynamic shape with a WeatherTech Sunroof Wind Deflector. Sunroofs can allow fast-moving wind inside the vehicle, creating noise and wind resistance. The deflector causes the wind to flow up and over the sunroof opening to reduce wind noise and turbulence. 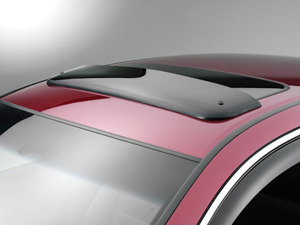 The WeatherTech Sunroof Wind Deflector is made of 4 mm thick, smoke-tinted cast acrylic. The tint helps keep the sun out of the eyes of the driver and passengers. The deflector attaches to your vehicle with a fastening system designed for your vehicle. The edge of the deflector is trimmed in rubber to protect your vehicle's paint finish. The WeatherTech Sunroof Wind Deflector allows you to enjoy a quieter, smoother ride with your open sunroof. Please allow 14 to 21 days for delivery. Express shipping and international shipping are not available on this item. To order, please type your vehicle�s year, make, and model in the order box. Use the chart for reference.